Field horsetail which is botanically known as ‘Equisetum Arvense’ is useful in the treatment of brittle bones, wounds, joint pain and muscle pain and kidney stones. Its antioxidant and anti-inflammatory potential helps in the management of diabetes mellitus, liver disorders, and bacterial and fungal infections. Field horsetail is an excellent source of essential minerals and health-promoting compounds which make it a potent immune booster. A high urine density is associated with dehydration, concentrated urine, and kidney stone formation. Evidence-based scientific studies have shown that treatment with field horsetail reduces urine density and thus, lowers the risk of stone formation. Its diuretic potential increases the passing of urine and hence, it enhances removal of small stones from the kidneys via urine. Therefore, drinking field horsetail tea can help in flushing out kidney stones and can be beneficial for individuals with stones. Field horsetail possesses Antinociceptive and anti-inflammatory effect. It reduces sensitivity to painful stimuli and helps in relieving pain. High doses of field horsetail induce sedative and analgesic effect and thus, it helps in lowering pain. Field horsetail is a natural diuretic that increases the production of urine. The diuretic action of this plant is attributed to the presence of flavonoids, mineral salts and phenolic compounds in it. Studies have revealed that due to its diuretic potential, field horsetail works quickly to relieve fluid and sodium retention or edema. It was further found that the effect of field horsetail was comparable to that of standard diuretic drugs. 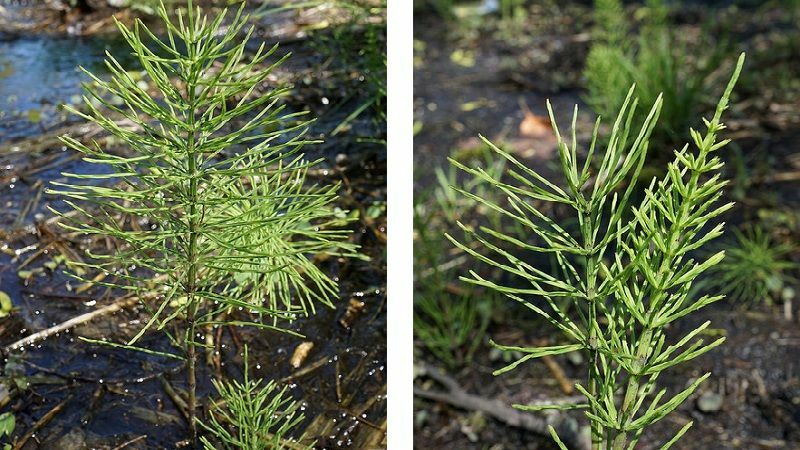 Field horsetail enhances quick skin wound healing. It reduces the size of the wound and lowers the level of inflammation too. The anti-inflammatory property of field horsetail has a healing and soothing effect. Furthermore, it promotes regeneration of skin cells and reduces the intensity of pain associated with the wound. Such an effect is attributed to the presence of saponin and silicon in it. Scientific studies have reported that field horsetail contains ‘silica’ that promotes absorption and utilization of calcium for bones. It was further noted that silica enhances stabilization and synthesis of collagen, a protein present in bone, which is responsible for its strength. Besides this, field horsetail increases the number of osteoblasts, bone-forming cells and inhibits ‘osteoclasts’, cells that break down bone tissue. Silica present in field horsetail further accelerates bone mineralization and reduces the excretion of calcium. Hence, treatment with field horsetail along with vitamin D, calcium, and zinc supplementation promotes the formation of bone and mineralization of bone matrix. Studies have reported potent hypoglycemic activity of field horsetail. Antioxidants present in it prevent the damage caused by free radicals to pancreatic beta-cells, producers of insulin. Health-promoting compounds present in field horsetail improve insulin sensitivity, lower insulin resistance and enhance uptake of glucose by muscles and tissues. Hence, glucose is used as a source of energy rather than being present in the blood in excess amounts. Field horsetail exhibits strong antibacterial activity against ‘Staphylococcus aureus, gram-positive bacteria that cause infections of the respiratory tract and skin. Such an effect is attributed to the presence of essential oils in it. These essential oils contain 25 different compounds in them that inhibit bacterial growth and prevent further increase in overall bacterial population. The immunomodulatory property of field horsetail is accredited to the presence of flavonoids and phenolic compounds in it. It helps in the treatment of inflammatory disorders and activates immune cells to fight against various diseases and infections. The protective effect of field horsetail on the liver is due to the abundance of health-promoting compounds such as onitin, luteolin, apigenin, quercetin, and kaempferol. Among these compounds, kaempferol and onitin exhibit the strongest hepatoprotective activities against liver damage. Results from scientific studies have shown that treatment with field horsetail prevents cognitive deficits. Such an effect is possible due to its high antioxidant potential. These antioxidants combat oxidative stress which otherwise deteriorates cognitive function. Quercetin present in field horsetail boosts cognitive health and helps in reversing cognitive impairment.